Every year I get questions about bizarre oak leaf damage that most people think is caused by a terrible insect infestation. Although some insects feed on oak trees, often the samples I see have a condition called Oak Tatters. I have an oak tree in my yard that gets oak tatters every year. Oak tatters have been happening for the past several years in Illinois, particularly those in the white oak family. The symptoms are quite bizarre. Much of the leaf is just gone. The tissue that remains is the vein tissue and a bit of leaf blade around the veins. Leaves appear eaten by a voracious insect that prefers non-vein tissues. The edges of the leaf that remain are often brown or thickened like a callous tissue. What is the cause of this condition? It is still a bit of a mystery, but most experts think it is related to herbicide or cold injury, or both. To my knowledge, there have been no specific studies looking at cold damage and leaf tatters on particular species. A 2004 study at the University of Illinois indicated a possible link between tatters and the movement of specific agricultural herbicides when leaves are unfolding in the spring. This symptom shows up in the spring time as leaves begin to emerge. Generally, within 3 to 6 weeks heavily impacted trees will produce a new flush of leaves to replace damaged leaves. The new flush of leaves usually does not show the tattered symptom. What do we suggest for action by the homeowner is your oak (or hackberry) has tatters? Try to improve tree vitality so that the tree can continue to produce new leaves. Usually, this means watering the tree in periods of drought, removing dead wood, and fertilizing with a general tree fertilizer in the fall. If you have a healthy old oak tree with these symptoms, leave it alone. We will keep you posted as we learn more about this condition. More information about oak tatters and other oak tree problems is available from the University of Illinois Plant Clinic at http://web.extension.illinois.edu/plantclinic/media.cfm. The fact sheet also covers oak tree diseases and insects. 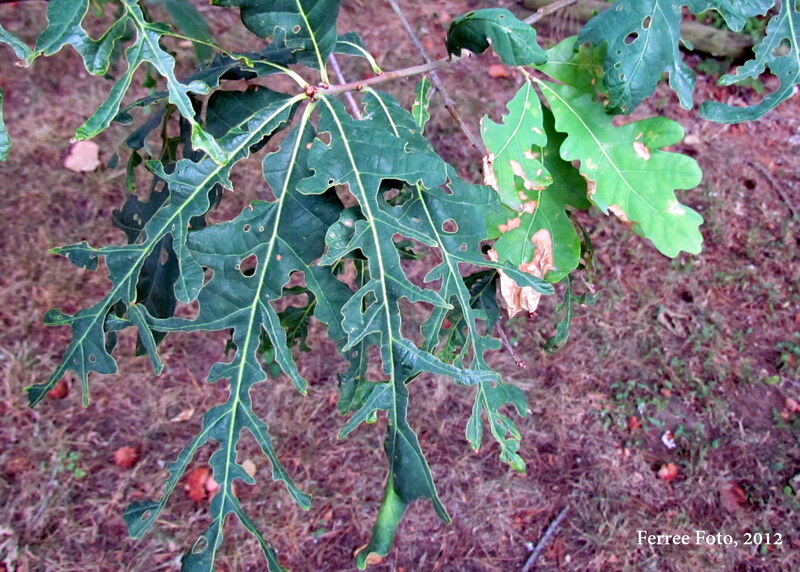 Oak problems are the topic of a University of Illinois Extension Four Seasons Garden webinar called Quercus Quandaries: Common Oak Pests in Illinois. It is available as a free taped webinar on the University of Illinois Extension Horticulture YouTube channel.